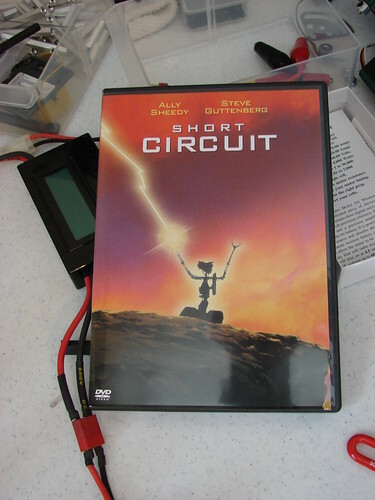 Around 8:00 last night I watched Short Circuit. Newton Crosby invented five army robots that are designed to blow up enemy camps, cars, etc. While NOVA (the place that builds the robots) is showing the robots off to investers, it rains, so they load the robots onto trucks to bring them inside NOVA. The investors go inside to have refreshments as the robots were transported. Number-5 gets struck by lightening and comes ‘alive’. “Number-5 is alive,” Number-5 declares. At the end of the movie, Number-5 changes his name. “Johnny-5…That sounds cool,” he says. Johnny-5 and other robots in the film were real r/c ‘robots.’ But in some of the scenes, they were not. To see how they made the movie, you can get issue 28 of Cinefex. Johnny-5 has a nice design (done by Syd Mead and Eric Allard) that you can get some ideas from to base your own robots. Lynxmotion (run by Jim Frye) sells a little robotic version of Johnny-5. Today at about 2:15 p.m. CST, I got the mail and found a package from Justin (the same Justin that I saw for Christmas). 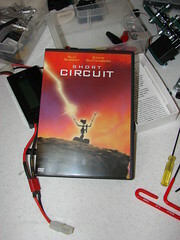 Well, I opened it and found the movie “Short Circuit” inside! Right away I emailed Justin saying “thank you” and “I’ll watch it on Sunday.” I’ve never watched this movie before but some of you probably have. It is 99 minutes long and was filmed in 1986. A search on Amazon shows that there’s also a Short Circuit 2. Yesterday I got home when it was late, so nothing happened on my robots. But today, I hooked everything up and it worked really well! For the rest of the day I put parts back in their drawers and bins.